Tuesday night featured a Moroccan theme with Food & Wine’s Grilled Swordfish with Cilantro-Chile Vinaigrette and Food 52’s Moroccan Vegetable Couscous. This was a little bit more than we normally tackle on a weeknight and Kim shares how it went. I started first by making the recipes’s own ras-el-hanout, a Moroccan spice blend. This was an easy step that involved simply measuring out the right amounts of saffron, cumin, ground ginger, salt, turmeric, cinnamon, cardamom, coriander (I only had seeds so I crushed them just bit with a wooden spoon), nutmeg and black pepper. The mixture smelled wonderful and exotic and in one step, I already felt like I was really making a Moroccan meal. I then prepped the vegetables (onion, garlic, carrots, potatoes and zucchini) for the couscous and drained the chick peas. The recipe also called for a 28-ounce can of whole San Marzano tomatoes to be chopped which I made a reasonable attempt to do with my kitchen shears right in the can–it worked fairly well and I definitely had no mess. I also set aside one cup of vegetable broth (the one not used for Sunday’s Mushroom Bourguignon) and measured out one cup of couscous. From there I turned my attention to the Cilantro-Chile Vinaigrette for the fish, which Food & Wine described as a smoky version of charmoula, a Moroccan herb sauce. So as not to dirty another bowl, I simply made it in a large measuring cup, starting first by measuring out a quarter cup of olive oil (since I was only making half), then adding the chopped cilantro and parsley, minced garlic clove, a tablespoon of lemon juice, one diced jalapeño (I used a green instead of the recommended Fresno or red jalapeño since I happened to have it around), saffron, crushed red pepper, smoked paprika and cayenne. I mixed together, tasted and adjusted a little by adding a little salt and a touch more olive oil. The consistency and some of the flavor profile reminded me of when I’ve made chimichurri. I set it aside and turned my attention back to the vegetable topping for the couscous. I started toasting the spice mixture in a small skillet for just a moment or two. I then sautéed the onion in a Dutch oven for about five minutes as mine cooked fairly quickly (about two minutes less than the recipe suggested.) I then added the carrots and potato (but not the garlic as the recipe suggested because I have bad luck with burning garlic if I put it in too early) and sautéed for about three minutes. I then added the tomatoes (breaking up any really large pieces) and the spice mixture, which really added a dramatic and immediate, wonderful aromatic effect. I let it simmer for 20 minutes and used the time to clean up the kitchen a bit. Just before adding the zucchini and chick peas to the vegetables, I started the vegetable stock boiling for the couscous and had that ready and waiting. I also started preheating the grill pan and brushing the swordfish with olive oil and sprinkling it with salt and pepper. After adding the zucchini and chick peas to the onion, carrot, potato, tomato mixture, I turned my attention to grilling the swordfish for three minutes on one side and then two minutes on the other side. I almost forgot to add the butter after turning the fish as the recipe suggests, but I’m glad I did as it added a nice richness. I gave the vegetables for the couscous one last taste and added just a little bit of salt to bring out all the wonderful flavors. 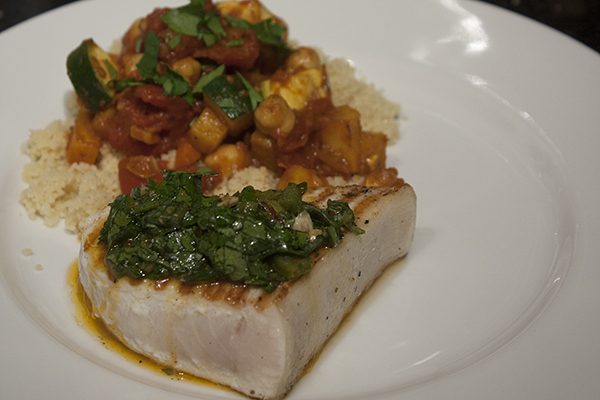 I started plating first by putting down the swordfish and then spooning on the cilantro-chile vinaigrette. I then put a small mound of couscous on the plate and put the vegetable mixture on top with a garnish of parsley. I served this with a wonderful wine, Goisot Exogyra Virgula Sauvignon de Saint-Bris 2012, which had a nice minerality that paired very well with the exotic tasting meal. This dinner was something very different from anything we’ve ever made in terms of spices and flavor combinations and really made us feel that we were eating something special and unique. The swordfish was excellent with the cilantro-chile vinaigrette, which was a nice mixture of herbal flavor and heat from the spices. The vegetable couscous was rich, hearty, and flavorful and even made Tony want to try chick peas. It might have been more than we would normally tackle on a week night but it was worth it to feel like we had a night in a foreign land.